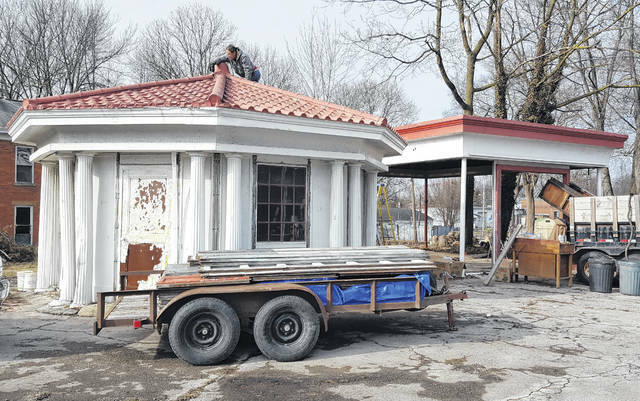 The octagon building and service garage of the former filling station at the corner of Lake Street and Central Avenue in Delaware are being dismantled and will be moved to Kansas and Missouri, respectively. Ben Eckart of Kansas and Lee Hoover of Missouri are collectors of vintage filling stations and are taking the buildings to their new homes to preserve them. A historic landmark on the east side of Delaware destined for the landfill has been saved. But no longer will the octagon-shaped structure grace the corner of Lake Street and Central Avenue. While the vintage gas station and service garage has set vacant for many years, the unique structure — which the Delaware County Auditor’s website lists as being built in 1930 — was once a bustling filling station for those entering or exiting the city from the east. Current property owner Jeff Shreves, who owns Sidney, Ohio-based Shreves Construction, confirmed Friday that plans are underway to make the site “more sellable,” which to do so required the removal of the structures. Instead of just demolishing the vintage buildings, they were placed online where they caught the attention of two avid collectors of such things — Ben Eckart, of Kansas, and Lee Hoover, of Missouri. Eckart added he is the proud owner of two other vintage gas stations, and when he saw the Delaware one was available, he just had to have it because, to his knowledge, it’s the only octagon-shaped filling station still standing in the country. According to Eckart, both Lake Street structures are prefabricated models that were built between 1925 and 1935 by Union Metal, a Canton-based company that is slated to close this year after 100-plus years of operation. Eckart’s passion and interest in these prefabricated gas stations is evident. Not only does he own several, but he operates a website dedicated to them at www.enarco.com. Earlier this week, Eckart and Hoover, with the help of several local men, began the tedious job of dismantling both the octagon building and service garage for transport to their new homes in Kansas and Missouri, respectively. Future of 85 Lake St.
Once the gas station and service garage are removed, which Shreves said could be as soon as Monday, he plans to clean up all the leftover debris, remove tree stumps, and place a for sale sign on the .324-acre property. “We think it’s a high traffic area and good location for something of that manner,” he added. Shreves confirmed that had it not been for Eckart and Hoover stepping up to save the octagon and garage, they both were headed to the landfill since he had no use for them, and the family who once operated the filling station was unable to take them off his hands.